Coronas Ice Maiden holds off a late charge from Crusin The Wagon to win the Izyk Bonus Challenge at Arapahoe Park Friday afternoon. AURORA, CO�JULY 11, 2014�Getting the her first win of the 2014 season, Coronas Ice Maiden held off a late rally from Cashin The Wagon to win the $20,700 Izyk Bonus Challenge by a neck at Arapahoe Park Friday afternoon. Bonified Man finished 4� lengths back in the show position. Under jockey Travis Wales Coronas Ice Maiden cleared the field early then held off her challenger from the inside rail while completing the 870 yards in :45.658 seconds, a 95 speed index. 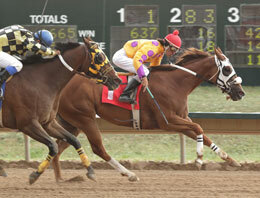 The $12,420 winner's purse boosted the sorrel miss' earnings mar to nearly $55,000. Tomey Swan saddled the WAVE CARVER filly for owner Darling Farms. The 4-year-old was bred in Kansas by Nancy McCoy from the Corona Cartel mare Corona With Ice. Owned-and-trained by John Hammes, Cashin The Wagon settled for the place check of $4,140. Michael Ziegler rode the graded stakes winning 5-year-old. Bred in Oklahoma by Katherine Hart and Marvin Willhite, Cashin The Wagon has earned over $95,000. Also owned-and-trained by Hammes, Bonified Man stepped up from back-to-back claiming wins at Remington Park last Spring to pickup $2,070. Buddy and Patty Newsome bred the former stakes winner in Texas. Tony Guymon was aboard the 8-year-old gelding. Completing the field were Rb Twenty Four Seven, Jmw Whata Wave, Ib Firstdownandgold and Pa.